There are so many Famicom Mahjong games it would make your head spin. I translated it. It's in the database. Please check the whole thread (and the database) before posting. Wait, did you already hack this into the game? Or did you just draw it? Because drawing a pic and fitting it into the ROM are two different things. Don't worry, I've already made several title screens so I'm aware of that. It's inserted and working. I started working on Outlanders a few years ago, and pikachumanson took over after I ghosted. But I wanted to at least offer any help that I could. I met a guy at Otakon selling old school resin kits including Outlanders, and turns out he's a huge diehard fan, collects cels from it and all that. I believe he even talks to the author of the manga on occasion. So if it helps to have someone read over the script who knows the source material in depth, I can certainly ask if he's available to do just that. Long time no action, so it's about time for an UPDATE! Real life has put almost everything on hold, but I've managed to claw my way towards a first release of Time Stranger. There's a long way to go until it's done, but I've reached the 10% mark, meaning I'm happy to give you guys version 0.1. It's the same system I used with my Conan translation way back: once I've got another 10% done, I release another version, because why not? Allow me to explain the game. You're a timecop of sorts, trying to change history by talking to historical Japanese figures by saying "yes" or "no" to their questions. The only other interaction is making sure your ship picks you up during certain scenes (though I haven't translated any of those yet, so don't worry). Depending on your responses, there are five timelines: the history as it actually happened in the history books (called True Timeline by me), as well as timelines dominated by money, power, love and food, respectively. So, if you answer in ways that promote food production, you follow the food timeline, for example. 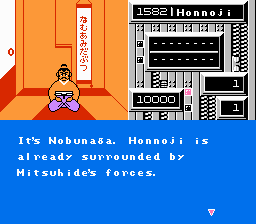 You start in Honnoji temple in 1582 with famed Japanese warlord Oda Nobunaga, as the temple is about to be attacked by his general Akechi Mitsuhide. Your responses to his questions dictate in which timeline you will set historical events. 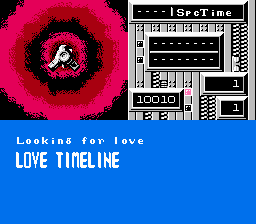 During the course of the game, you can switch timelines, be sent back in time, or get a game over somehow (such as being killed). During the game you can press B to randomly warp, but you never know where you'll end up so it's probably best avoided. So far all that is done is the whole first section with Nobunaga at Honnoji, plus the first branch points for True, Love and Food timelines. As I translate the game, you'll be able to continue onwards. Of course, if you knew Japanese, you probably wouldn't need my translation. Anyway, enough talk, here's v0.1! Obviously, everything is preliminary at this stage, including the font. I'm tired of using Final Fantasy's font in all my translations, so one day I think I'll probably sit down and draw my own. Seriously, not one post commenting on v0.1 of Time Stranger? Hmm. 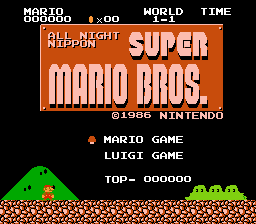 Anyway, I had a spare hour or so today, so I decided to change the title screen of All Night Nippon Super Mario Bros.
Quite a simple job, really. And of course there's no other Japanese text that I know of (the ending is the same as SMB2j I believe, so in English). My only concern is that each time you complete World 8-4, it adds a flashing star on the title screen, which is then saved on the disk. Now, because of me using two lines, the star appears on the next line, and doesn't flash. This could be seen as a problem, but unless you complete the game twenty times or something, I don't think it's that big of a deal. Haven't added it to my site or the database yet, might do soon, if it's worth it. EDIT: just read online that you need to complete the game eight times to access Worlds A to D. I changed the save file to 8 and it does exactly that. The eight stars still fit on the title, they just don't flash, and I don't think I can change that, because that palette needs to be shared with the letters of the title, meaning that would flash too. I'd meant to say congrats on the 0.1 of Time Stranger! I hope my comments in the script forum are helpful. It seems like activity has dropped off sharply here. Did everyone go back to school or something? Yes, your comments on Time Stranger were helpful, thanks. I just haven't been back there since then. Seems funny to me that people hacking old NES games could have school to go to. I'm certainly very busy in real life, but it's got nothing to do with school. Actually, I was browsing the FDS list last night and noticed Knight Lore (a Rare game originally on ZX Spectrum) only seems to have Japanese menus, so I think I'll have that done soon. Well, someone's doing that Dandy action RPG for the FDS, so I guess there's still some activity. I noticed that usually the majority of translations come out during the first half of the year, though I bet there are still some good ones coming before 2017 ends regardless. I finally have some time to look into the patch, so I'll surely have some feedback soon! Thanks for your work thus far, Psyklax. Very pleased to see the continued progress you've been making. Of course, some of those folks might be teachers, professors, etc. School isn't just for students, after all! Just an update to say Knight Lore is done. I'll be uploading all these FDS game patches eventually, but I wanted to talk briefly about my experience with hacking this one. I needed a few extra bytes to do the translation I wanted, just the "set side A/B" message, but I couldn't find any empty space in which to put it. Eventually it struck me: of course there's no empty space, it's not a ROM. A ROM has to be a specific size, so there's usually empty space, but FDS uses disks with files, and the files can be any size, as long as the disk is the right size. So there's empty space on the disk, but not in RAM during playing. So what to do? Well, there's a very simple header format for all the files on the disk, which says the size of the file as well as where it's loaded into RAM. I noticed that for each level, Knight Lore used a different file, each a different size. I thought "so it's overwriting the same position in RAM, but it's always different amounts. What if I just add a few more bytes and change the header? It won't be overwriting anything important". So I did, and it worked. Moral of the story is: FDS seems weird when you've done a lot of NES hacking, but there are advantages, such as being able to expand the files on the disk. No messing around with mappers here. Awesome! Any chance this might work with Miho Nakayama's Tokimeki High School? FCandChill said they wanted to edit the script themselves, then kind of disappeared. My guess is Knight Lore had allocated a certain amount of RAM for holding level data and allows file expansion up to the maximum size. You could expand a file but you have to be careful that expanding the file doesn't overwrite other data loaded (or written at runtime, the PRG-RAM is still writable). Of course, if you are manually inserting extra space with a hex editor, you would have to insert it at the right space in the file within the "ROM", then remove extra space so the disk side size total is still the 65,000 byte size, as well as updating the file's header with the right size. Or else I imagine you'll effectively corrupt the game. What it does is first load a file called DATA on side A which fills the space from $CB00 to $DFFF (the end of usable RAM). Then when you start the game, you have to insert side B, which loads a level file (D1 to D8, with D9 on side A), each time at $CB00. Thing is, each level file is a different size, overwriting a different amount each time. I figured that the eight extra bytes I needed in each level file wasn't overwriting anything useful, as a result, but just to be sure, I played with breakpoints after that position. There ARE some things right at the end of RAM that are read ($DFFF and thereabouts) but since I'm only adding eight bytes, that's no big deal. The smallest level file overwrites up to $D8D4, while the largest overwrites up to $DDC8. Clearly everything in between gets written and rewritten so much that it doesn't matter at all. And yes, I remembered to remove enough zeroes from the end of the file to keep the file size correct. Um, maybe? I looked on the disk and while there is space, you have to know what's happening inside the game while it's running, like I just explained with Knight Lore. In the case of that game, I was able to add a (small) amount of extra data, but like with many things in ROM hacking, it's a case-by-case basis. There's a program called Table Dumper Pro that was done by my friend DvD. Among other features, he wanted something to aid him in Fds hacking. So, there's a file splitter and merger that also produces a file list with all the disk offsets, ram offsets, free space etc. It makes FDS hacking much more convenient. I used FDS Explorer, does pretty much the same thing. The last six bytes of RAM are supposed be reserved for a game's vector table, I think. Though I don't know if the FDS supports IRQs, so I imagine only NMI could go used, as I don't think Reset could be used since I don't think the FDS supports soft-resets. But I have no experience in that area, it's just what I think I've read. I don't have a real FDS so no idea about soft resets, but I think FCEUX can do it, for what it's worth. As for IRQ, NMI... I haven't got there in my NES knowledge, don't really understand it at all.